Starting with Brunelleschi's invention of perspective and Galileo's invention of the telescope--two inaugural moments in the history of vision, from two apparently distinct provinces, art and science--this volume of essays by noted art, architecture, science, philosophy, and literary historians teases out the multiple strands of the discourse about sight in the early modern period. Looking at Leonardo and Gallaccini, at botanists, mathematicians, and artists from Dante to D rer to Shakespeare, and at photography and film as pointed modern commentaries on early modern seeing, Vision and Its Instruments revisits the complexity of the early modern economy of the image, of the eye, and of its instruments. 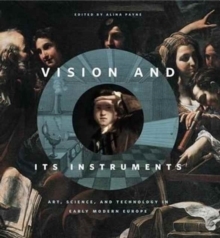 The book explores the full range of early modern conceptions of vision, in which mal'occhio (the evil eye), witchcraft, spiritual visions, and phantasms, as well as the artist's brush and the architect's compass, were seen as providing knowledge equal to or better than newly developed scientific instruments and practices (and occasionally working in conjunction with them). The essays in this volume also bring a new dimension to the current discourse about image production and its cultural functions.